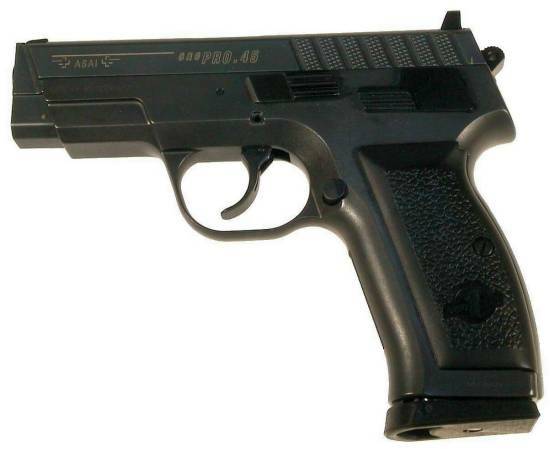 A semi-compact weapon as good as it looks for law enforcement and military purpose as well as for civilian shooting. ASAI (Advanced Small Arms Institute), located in Solothurn, Switzerland, apparently now out of business. This pistol was imported into the United States by MAGNUM RESEARCH (also importer for the US of the Israeli IMI Desert Eagle and Jericho pistols), and imported in Italy by ALGIMEC (manufacturer of the AGMi and AGM-1 semi auto carbines).